Your UV bulb should be replaced each year in the Spring. We recommend around Easter. The bulb will typically be effective for 8000 hours, so by changing it in the Spring it will be producing the optimum output through the brighter Summer months. We also recommend cleaning the quartz sleeve when you are changing the bulb. The bulb is inside the quartz sleeve. The sleeve can become dirty and calcified reducing the efficiency of the unit. Take care when cleaning the sleeve as it can be easily broken. Replacement 4W TMC UV bulb. Used in many UV clarifiers across the industry. 150mm (6") long. 16mm diameter. 2 pins at each end. Replacement 7W PLS UV bulb. Used in many UV clarifiers across the industry. Double tube. 2 pins at one end. Replacement 8W TMC UV bulb. Used in many UV clarifiers across the industry. 300mm (12") long. 16mm diameter. 2 pins at each end. Replacement 9W PLS UV bulb. Used in many UV clarifiers across the industry. Double tube. 2 pins at one end. Replacement 25W TMC UV bulb. Used in many UV clarifiers across the industry. 450mm (18") long. 26mm diameter. 2 pins at each end. Replacement 15W TMC UV bulb. Used in many UV clarifiers across the industry. Replacement 16W TMC UV bulb. Used in many UV clarifiers across the industry. 2 pins at each end. Replacement Oase 7W PLS UV bulb. Used in many UV clarifiers across the industry. Replacement 11W PLS UV bulb. Used in many UV clarifiers across the industry. Replacement 55W TMC UV bulb. Used in many UV clarifiers including the TMC Proclear 55 & 110. Also the EA 55W. 900mm (36") long. 26mm diameter. Replacement 30W TMC UV bulb. Used in many UV clarifiers including the TMC Proclear 30W. 900mm (36") long. 26mm diameter. Replacement 18W PL-L UV bulb. Suitable for the Oase 18W UV clarifiers. Double tube. 4 pins at one end. Replacement 24W PL-L UV bulb. Suitable for the Oase 24W UV clarifiers. 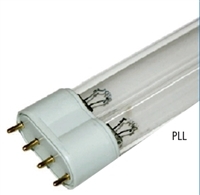 Replacement 36W PL-L UV bulb. Suitable for the Oase 36W UV clarifiers. Replacement 55W PL-L UV bulb. Suitable for the Oase 55W UV clarifiers. Replacement 18W Oase UV bulb. Replacement 24W Oase UV bulb. Replacement 36W Oase UV bulb. Replacement 55W Oase UV bulb.